The title is a polite way to describe the naked body. 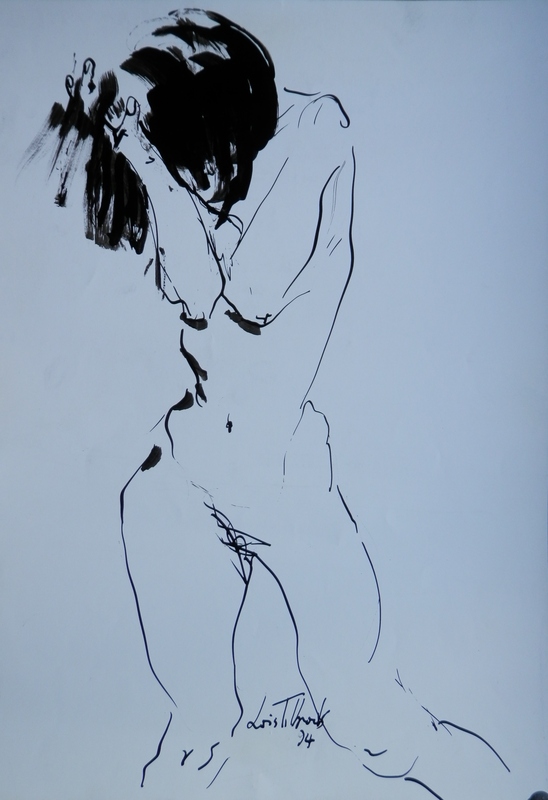 As My collection increases, I have acquired several depictions of the female form. The name #LetiziaCerio (I use this spelling since it appears on the drawing in this form) is not a household name unless you come from the Isle of Capri. There she is famous. She was born in 1906 on Cyprus. Growing up her love of art led to 80 years of painting, drawing, wallpaper and fabric design. She loved artists of all kinds, fashion, and Capri. In her lifetime, Letizia Cerio designed wall paper, she drew for Vogue magazine, as well as creating her own art. Her designs are still being used today by her grand-children in their creations at ‘Eco Capri’. 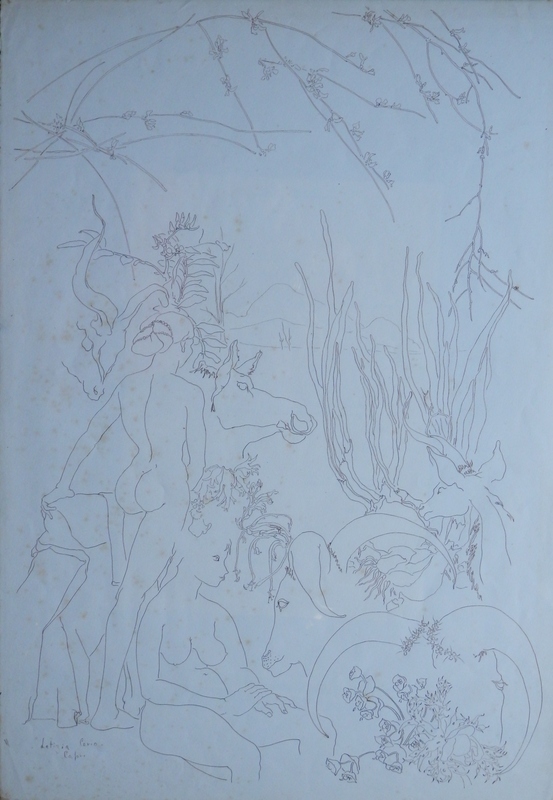 ‘Paradise Lost’ is a pen and ink drawing of two nudes communing with nature – both plant and animal. Flowers bloom, trees bud, nature and human in harmony. It has not been kept well so some foxing has begun on the paper. Even so, a lovely piece. From Cyprus to a woman who was born in Australia. #LoisTilbrook (1943-2006) was a ‘pioneering’ anthropologist, an educator, an artist, a curator and a psychotherapist at different points in her life. She lived, for a while, down the road in the city of Cambridge and died in London in 2006. A local auction houses’ recent sale of paintings and sculptures by the late Dr Lois Tilbrook, was completely sold out. An image filled with life and energy. A few lines and there is a form which captures life in its’ all-together, unashamed and direct. And to finish, we go back in time to visit #AlbertGuillaume (1873 – 1942). He is remembered for his poster art. He created theatre posters as well as advertising posters that were greatly influenced by the work of one of the pre-eminent poster painters, Jules Cheret. I call this colour lithograph ‘After the Bath’. Guillaume is also known for his satirical drawings that were published in Parisian humour magazines. Guillaume lampooned the foibles of French society. During the 1890’s – the gay nineties – a collection of notable artists including Guillaume helped transform the boulevards of Paris into a gallery of fine art. The streets came alive with colour. Posters soon appeared from many of the era’s great masters – shaping the Parisian landscape. The female form in art. Beauty to behold. This entry was posted in Drawings and Sketches, Lithographs and tagged arms, bath, buds, female body, flowers, legs, nudes, rams, stag, torso, towel. Bookmark the permalink.